A few months ago, I received a sample of this toner in a swap I did with Sarah from Sugarpuffish. I had mentioned to Sarah that Balm Balm was a brand I was interested in trying and she very kindly included their Organic Facial Kit, which includes mini sizes of most of their skincare line. I'm a little embarrassed to admit how long it's taken me to actually give anything from the kit a try, but my skincare routine has been working so well that I didn't want to risk changing anything! Nevertheless, I finally decided to try out the toner. I usually use a DIY blend of witch hazel and essential oils, so the Balm Balm one, which contains only witch hazel, glycerin, and alcohol, didn't seem like too big of a change. It's an extremely gentle toner. I've had great results using witch hazel, but it can sometimes be a little drying. The glycerin here definitely helps with that! 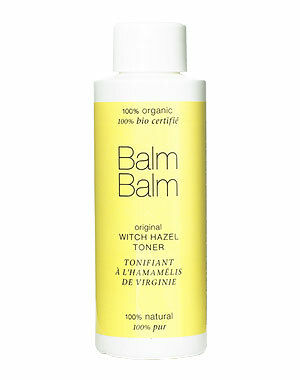 My skin never felt dry while using the Balm Balm toner, so that isn't something you need to worry about. Ingredients: Hamamelis Virginia Extract (Witch Hazel), Glycerol, Grain Alcohol. The toss up is that the glycerin did leave my face feeling sticky. I used a cotton ball to apply it, so it isn't like I was applying tons of product, but my face was always left with a long-lasting tacky feeling. I say long-lasting, because I could still feel it after applying moisturizer, and even after putting on makeup! Balm Balm's prices are generally very affordable and this toner retails for £13.25 (for 100mL.) Honestly, that's more than I'm likely to pay when I feel like I can very easily make something comparable myself, but if you're someone who prefers to purchase your skincare and you're looking for a simple, gentle toner, this is a good product to consider. I will say that since trying this, I've bought some vegetable glycerin and I've been inspired to start playing around with my homemade toner recipe again. I'm curious to see if it's possible to use just a small amount of glycerin to get the added hydration, but still avoid the sticky, tacky feeling. If I'm successful, you'll definitely hear all about it! This toner sounds great! However, the price is quite a turn off...Can't wait to hear updates about your homemade toner! Great review! That sounds just like what I need, aside from the stickiness. I hate sticky face products, so I definitely wouldn't buy it. I hope your DIY works out well!! Thanks! I feel the same, I liked everything about this except the sticky feeling! I haven't tried very much from them, but I want to try more! Their lip balm is one of my favourites.